- It can be played at 220V or 110V. - It has provisions for external speakers. - Power consumption is 7W(approx). Keeping the various requirements of clients in mind, we are instrumental in providing Electronic Tabla Taal Tarang. 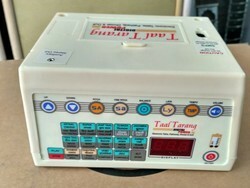 We are the dealer of Electronic tabla manufactured by Radal Electronics Pvt. Ltd.
excellent sound, full octave, different talls with variations with compact inbuilt speaker and a special fill in feature for the first time. Enlisted amongst one of the credible business names, we have been involved in presenting a wide variety of Electronic Tabla Set. We are the prominent manufacturer and exporter of wide rang of Electronic Musical instruments includes Nagma which has widely accepted from our clients.